Haiti Babi hand makes artisan hats and blankets with eye-catching designs and a sophisticated color palette, a refreshing break from typical pastels. Each piece is beautifully knit with a contrasting crocheted edge featuring a pop of color at the end. Made from durable 100% Pima cotton, they are soft and snuggly, but can endure teething and washing. As much as Haiti Babi’s designs caught our eye, its story captured our heart. It’s a sad fact, but roughly half a million Haitian children live in orphanages, most with living parents who simply can’t afford the basic necessities to raise them. Atlanta-native Katlin Jackson volunteered at such an orphanage, and was inspired to change this cycle of poverty. She founded Haiti Babi, which trains Haitian moms to knit and crochet, an employable skill that provides a livable income. The mothers gain economic independence and, most importantly, their families can stay intact. 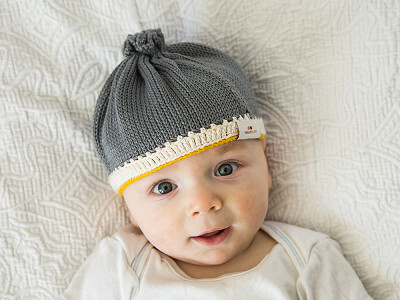 These snuggly, exquisite blankets and hats do more than keep your little one cozy and cute. The impact on moms and children in Haiti gives each piece true significance. Hi Grommet Community! My name is Katlin and I am the founder of Haiti Babi. We are on a mission to keep families together in Haiti. Putting moms to work is just one of Haiti Babi’s missions. Haiti Babi hires moms in Haiti to knit and crochet high-quality artisan baby goods. A job empowers these moms to earn a living while caring for their families. By purchasing a Haiti Babi product you empower a mom in Haiti to care for her children and keep them out of orphanages. a little too pricey for everyday me. Hi Tryna, we appreciate you recognizing the great cause they are supporting. While we understand these products may be out of the price range of some, sharing this will help support the cause as well. I could have someone knit me one for a cheaper price (regarding the blanket). @Loretta agreed. Would rather purchase several useful things for a new mom. They do look nice but babies don't care if they throw up on something nice or something not so nice. Loretta, Denice, we understand this is out of the price range of some. But in this case, you are paying for more than a product. It's more of a social enterprise. Haiti has the worst poverty level in the Western hemisphere and the higher price of these products is a result of paying for fair wages, better working conditions, and the chance for Haitian mothers to be with their children again. In addition to paying fair wages and having safe working conditions for the artisan moms at Haiti Babi, a big part of the cost of a Haiti Babi product is the yarn itself. We use 100% Pima Cotton yarn. Unlike regular cotton, Pima cotton fibers are twice as long as normal cotton, meaning it will last twice as long as a normal cotton blanket, you can wash it a bunch and it won't pill, and it actually becomes softer over time. A Haiti Babi blanket is an heirloom product that will last in your family for a long time, and through all of its moments as a cape, canvas, magic carpet ride or cuddly companion (even through the throw-ups!). These look beautiful and it's a wonderful idea for those who can afford them. However, at these prices, many people who would love to support Haitian families while giving a beautiful gift will not be able to do so. I am solidly in the middle class and it's outside of my budget. Hi Carol, as I've mentioned above and below, we completely understand these products will be beyond the budget of some. Another way you can help support this cause is by sharing it online and spreading the message. I think this is a great project. How much of the money goes back to the Haitian mothers? Hi Calene, thanks for the kind words. I'll let Katlin provide specifics of the percentage of revenue going back to Haiti. What I do know is that each Haiti Babi mom earns twice the minimum wage in Haiti so that she may cover her current expenses and save for the future. Haiti Babi is also currently working to teach moms the basics of budgeting and handling their finances. Hi Calene! Mike is correct, Haiti Babi moms earn over twice the minimum wage in Haiti, allowing them to cover their basic expenses and giving them the opportunity to save for their future. Most of our moms use their new income to send their kids to school and move into a safer house. We don't use the "percentage of profit" model, instead, we pay Haiti Babi moms per piece they complete. This way, they are getting paid when they complete their work, as opposed to once the product sells. Haiti Babi takes the selling risk away from the moms, so they are ensured steady and sustainable income- a key to lifting themselves out of poverty. About 1/4 of the product revenue Haiti Babi receives goes towards the employment of the artisan makers. @Katlin - question: if 1/4 of the $78 blanket (or $19.50) goes to the knitter, where does the other 3/4 (or $58) go? Presume it is for yarn, shipping and handling and middleman fees. While I applaud you for helping those in Haiti as I know it is so impoverished, I would whip out my checkbook quicker if I thought they were getting the bulk of the excess $$$. I knit and I know how long it takes to make a blanket and cap by hand - a long time. Will the knitters percentage of the revenue grow at any point? Minimum wage in Haiti is about $5.25 a day so if they make $19 and it takes them 4-5 days to make the blanket, it is barely minimum wage if at all. I am on a fixed income and want every dollar to go to the one who really needs it. I also Have a new grandson who needs a lot of things but will receive far more than a mother in Haiti. Can you help me sort through this? @Marty Thanks for your question, I'm happy to provide more clarity. With retail sales, typically 50% of the purchase price goes to the retailer. This is the case with the majority of retailers and the majority of products. For example, if you buy something for $30 at Target, $15 goes to Target and $15 goes to the product company. So, of the $78 price for a Haiti Babi blanket, $39 is going to Haiti Babi (typically, some retailers take more and some take less, but the majority follow this model). Of the $39 to Haiti Babi, approximately $15 is going towards the cost of materials (which is the high quality Pima Cotton yarn). Approximately $10 is going to our artisan makers. $2 is spent on the packaging and product tags, and $3 is spent on shipping (shipping of raw materials, and finished product to our distribution center). All in, that is about $30 for the cost of making the product and getting it ready to send to our customers. The remaining $9 is what goes into the costs of doing business, for example paying the rent on our safe workplace in Haiti, the transportation stipend paid to our artisan moms so they can get to and from work safely, lunches everyday for our Haiti team, our Managers in Haiti, business taxes in Haiti, insurance, website fees, marketing costs, etc. I'll also let you know that Haiti Babi is a non-profit, so any extra revenue is not being paid out to investors, but rather being reinvested back into Haiti Babi to create and sustain more empowering jobs for moms in Haiti. Also, as you may find it interesting as you are thinking through the economics, a Haiti Babi mom can make on average one blanket a day- although many of the moms that work for us have gotten so good they can make two! They work 4 days a week from 9am - 3pm, such that they can drop their kids at school on the way to work and pick them up on the way home. @Katlin I just want to say thank you for taking the time to explain in such detail the cost/ profit breakdown. I think some are missing the point when they point out that they can buy cheaper. As you have correctly pointed out this is a social enterprise. @Tobin Sorry I hit submit too soon. Your breakdown of cost and where the excess money is going puts me at ease. All to often I will not buy a product or support a cause because such a small percentage actually goes to helping those in need. Your breakdown and distribution of profits seems very fair to me. I will be buying one for my next grandchild (crossing fingers soon, lol) thank you. Hi Tobin, thanks very much for the comment. We're glad to hear it. Your grandchild will love it! What is the hat circumference, and length from crown to edge? Hi Sara, the hat circumference is about 23.5" and the length crown to edge is 6". Thanks for the question and for putting my geometry skills to good use! Yes, the hats are sized for babies 0-6 months old. We'll have 6-12 month hats online in the next couple of months! What percentage of each item sold is given to the knitters/crocheters? Hi Donna, as Katlin mentioned above, Haiti Babi doesn't use a "percentage of profit" model. Instead, the moms are paid for every product they complete. In total, about 1/4 of revenue for all products goes towards the employment of makers. Hi Donna. Please see my answer above to Marty for a more detailed breakdown of the economics of our product. Thank you! Joanne here, Chief Discoverer @ The Grommet. My personal attachment the Haiti Babi began with a meeting with Katlin last January. At first, I was completely smitten with the beautiful quality and the fun, sophisticated designs of the blankets. THIS was going to be my personal go-to baby gift in 2015. When I learned about the social focus and company that Katlin was creating, I was inspired. We have asked Katlin to share the details of her business model so that you feel comfortable supporting Haiti Babi. One of my best friends is having a baby soon, and I am going to purchase the gift set. The people of Haiti need our help, and my friend will appreciate that I'm helping other moms in addition to giving her a beautiful gift. Thanks for bringing these gifts to the Grommet--these are the kinds of products that make it a special site. Thank you very much for the feedback, Betsy. We really appreciate it! Love the idea, great job! !